I was invited to the Douro to participate in Port Wine Day, a celebration of the 10th September 1756 when Douro was the world’s first regulated and demarked wineregion. 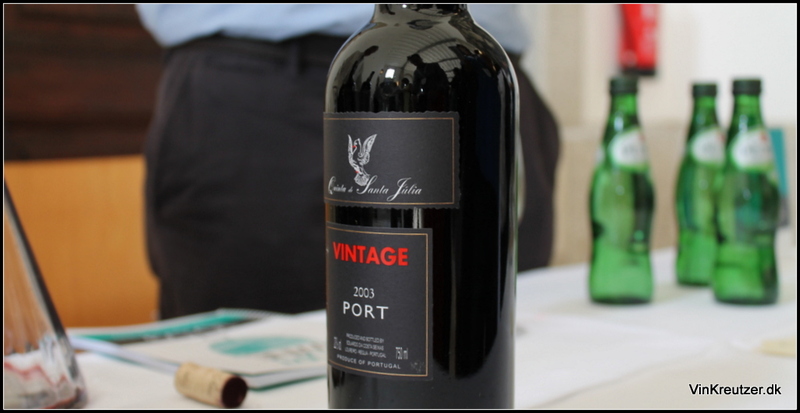 The celebration took place with a tasting of Vintage Port from the first decade of this century. Each producer brought 2 different years, showing the different styles they made. It was really interesting to taste all these beautiful wines side-by-side and learning the different years better to know. I can conclude that 2007 is still a fantastic year for me, the relative high acidity gives most wines a nice freshness that I like. Here you will find the notes from the Vintage Port that I tasted, and short comments. 2009 Alves de Sousa, VT – vey fine structure, fresh acidity and intensity. A wine to enjoy from early on. Made out of grapes from 2 vineyards owned by the family. Quinta da Oliveirinha in Cima Corgo and Gaivosa in Baixo Corgo. 2003 Quinta da Gaivosa, Alves de Sousa, VT – soft tannins, balanced, without too much heat from the vintage. One of the better ‘03s. The colder Baixo Corgo shows its potential here in a hot vintage, where the balance stays in the wine. 2009 Bulas, VT – a very soft style with mature tannins in this hot vintage. Dark fruit and nice minerality to give freshness. A Port to enjoy even at this young age. I had a good talk with the winemaker here Luis Rodrigues. 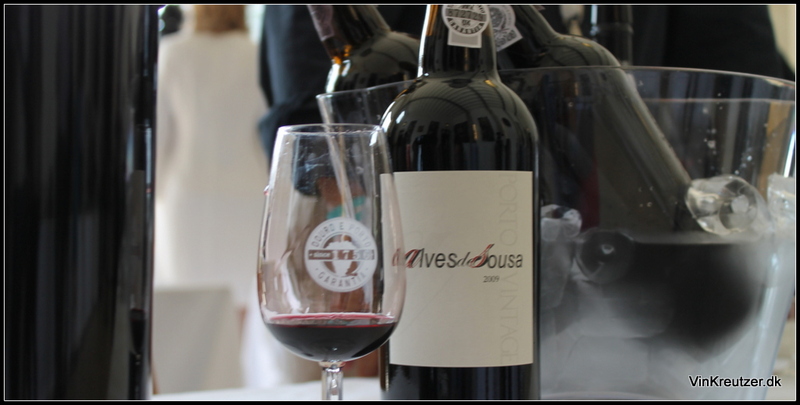 The Quinta da Costa is situated in the cooler Baixo region in Douro, which gives more freshness in the wines in the 09 vintage. 2006 Denarcacao, VT – a completely different style, from Bulas. 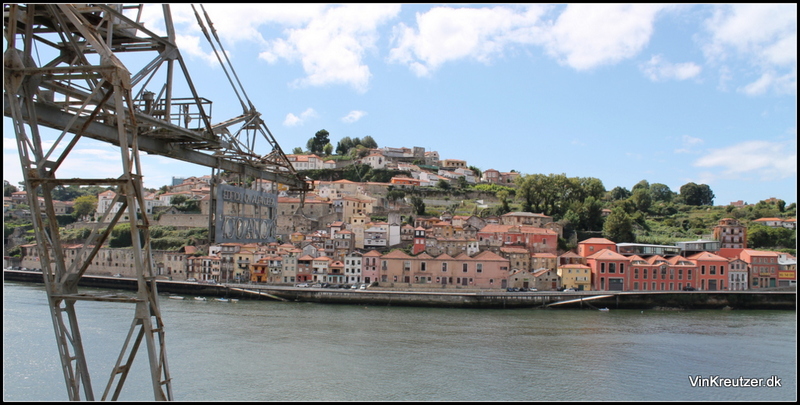 Here is a rustic Port with dry tannins and more focus on power than elegance. On the look out for power and tannins they have lost the finesse. Also freom Quinta da Costa in Baixo, but just made in and old style that is completely different from the more balanced and soft Bulas ’09. 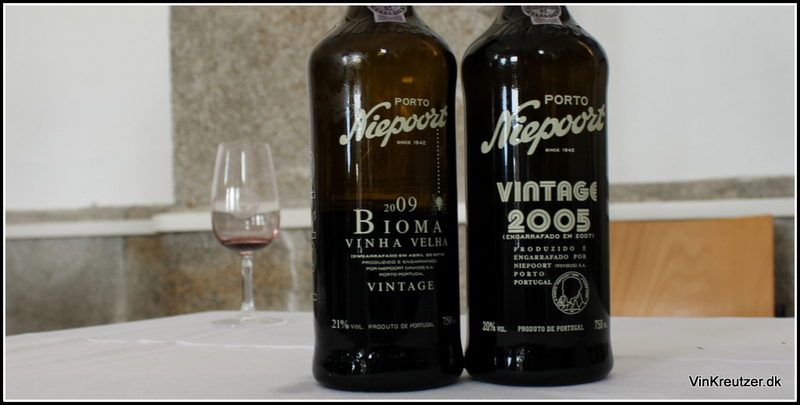 2009 Niepoort Bioma, Vinha Velha, VT – a unique Port that steps up one notch compared to many of the others on this day. As usual Bioma is about balance, this for me is like a violin doing a solo, with a complete symphonic orchestra in the back. You have the fresh tones hanging high, and then when you dig into it it develops deep dark fruit. The tannins are present, but not dominating. Very high taste intensity and it just keeps on developing new nuances. Had a good talk with Dirk Niepoort who was at the tasting. This Bioma is made from a single parcel of vines called Pisca, with more that 80 years old vines. It is made in the old style with 3 years of maturation on wood, rather than the normal 2 year period. 2005 Niepoort, VT – black as the night. Complex with high tight tannin structure and a good acidity to balance. Notes of plum and schist shows to me the 2 sides of this magnificent Vintage Port. You find a classic hot vintage developing dark mature berries, but then again you have the Niepoort-touch of freshness. This VT is not in its prime drinking window, for me it is shut down but will develop into a fantastic wine with another 10 years at least. This is a classic example of Niepoort using only good grapes in a hot vintage, which assures you no notes of raisins, only fruit! Disclaimer: I have worked for the Danish importer of this for 10 years and is a huge fan of the Ports from Dirk Niepoort. 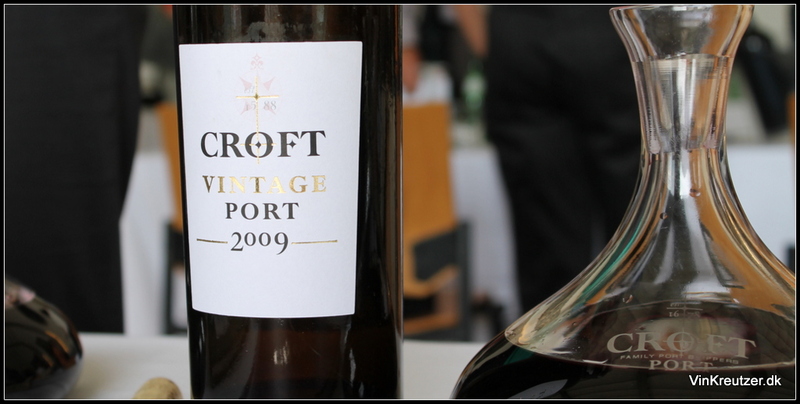 2009 Croft, VT – very juice and delicious. Focus on mature red fruit, schist and balanced tannins. Ends a little predictable and gets to easy and a bit boring. Part of the Taylor Fladgate Fonseca group. Made by David Guimaraens. A very populistic style IMO that kind of ends like the little one in the line-up against the other ‘09s from the group today. 2003 Krohn, VT – corked, but the woman serving wasn’t shure, so she didn’t replace it. In a big tasting like this, no reason to try and convince her. 2009 Taylor’s, VT – pure candy. Here is sweet notes of rhubarb, licorice and raspberries. Fresh and with an easy going tannin power, without being to much. A nice edge in the finish from the acidity made this a glass to drink, rather than spit. Very interesting to taste this monster. Even at a young stage in live this is a pleasure to drink, but it has so much potential! I hope it will not all be drunk young. 2009 Fonseca, VT – WOW what a wine! Black in all aspects, from color to nose and the berries in the taste. Very high tannin, but well balanced by fresh acidity. Seems a little tight, but opens up with short time in the glass. A deliciuous style and the glass I went back to at the end of the tasting to sip on the dock outside the tasting room. Interesting to taste Taylor’s and Fonseca side-by-side. 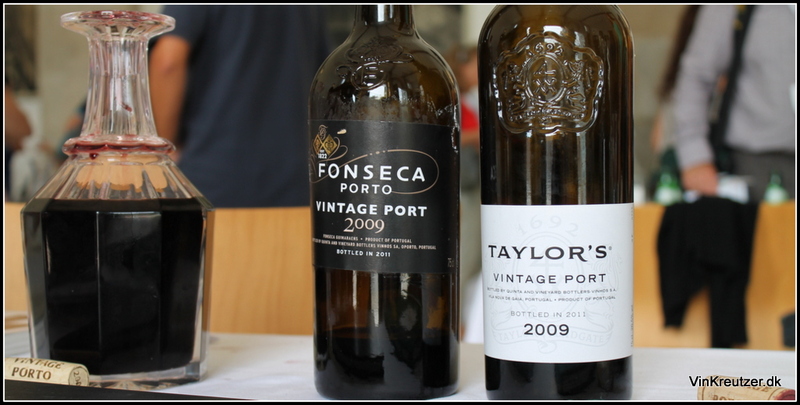 The Fonseca is more powerful and structured, but both are fantastic Ports. I would love to have these by the case in the cellar and track development in the coming 50 years. Good job by David Guimaraens who is involved in both, good to show the best from different vineyards and maintain the style of each house. 2003 Quinta Santa Julia, VT – very medicin like and herbal, green bell peber, and nice red fruit character. An unbalanced wine where I find to many unmature notes in a very hot vintage. 2000 Quinta do Noval, VT – deep and not even ready, growing with time in the glass. A big Port with good personality. Tannins are very balanced and standing in the back. The fruit grows and ends with a good grip of tannins. A nice open and spicy VT.
2003 Quinta do Noval, VT – too hot and completely out of balance. If the bottle wasn’t off, then the wine is really an example of how a good producer can go wrong in a difficult vintage like ’03. 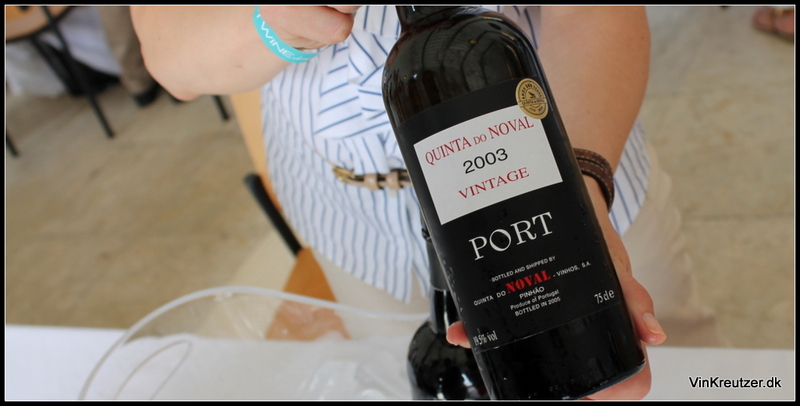 A classic producer and very interesting to taste one of the more mature Vintage Ports here today, with the 2000. On the contrary also interesting to taste a cooked ’03. 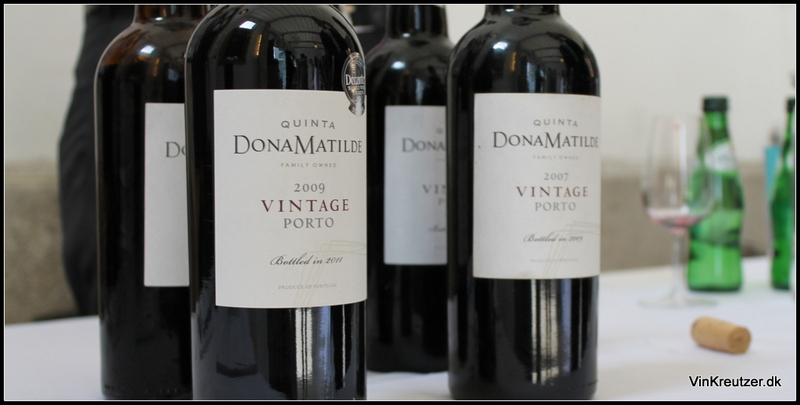 2007 & 2009 Quinta Dona Matilde, VT – very elegant in both vintages. A lot of dark fruit and nice dry tannins to give balance to the sweet notes. This is growing but stays more elegant than powerfull. A nice talk with Manuel and Filipe Barros who owns this Quinta. This used to be the prime fruit in the Barros VT, but when the family sold, they kept this Quinta and works in the same classic way as always. Well balanced wines, made to enjoy. 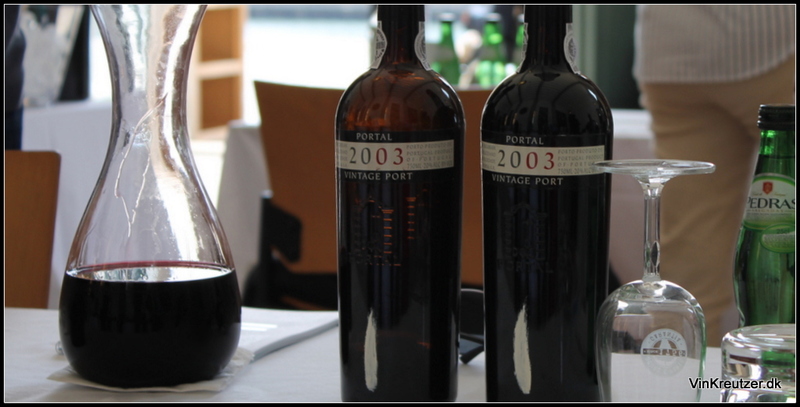 2003 Portal, VT – cooked and made from raisins and overmature berries. Heavy with a mild tannin structure, but gets boring IMO. 2007 Portal, VT – very nice with good fresh acidity and notes of raspberry and strawberries. Seems much cooler and well balanced than the ’03. 2007 VT marks the 10th Vintage from Portal and shows really well. 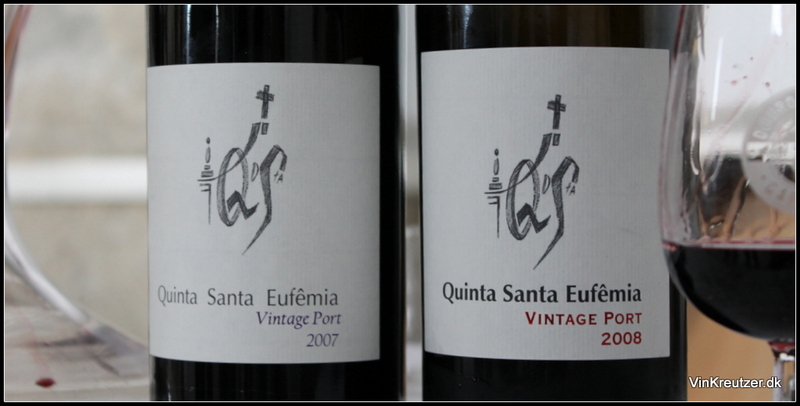 2007 Quinta Santa Eufemia, VT – very fine red fruit, cool fruitacidity and nice tanninstructure. I really like the elegance and focus on the red fruit in this. A long aftertaste, where the fruit just stands strong and precise. Disclaimer: I work for the Danish importer of this. The winemaker Alzira was there to present the wines and it was a pleasure to taste this next to one of the few ‘08s at the tasting. 2008 Quinta Santa Eufemia, VT – IMO a much more balanced and soft Vintage, creamy texture with more soft tannin, floral aromas that gives a different dimension. Holds on and develops beautiful in the finish with minerality and fresh fruit. Both are made from a mix of 70% Touriga Nacional and 30 % Tinta Roriz, from more than 50 years old vines. All grapes on this Quintas, as with many others, are picked by hand. All grapes have been pressed in traditional lagares by foot. A nice classic producer IMO, that I visited the day after the tasting, blog coming on that visit later. 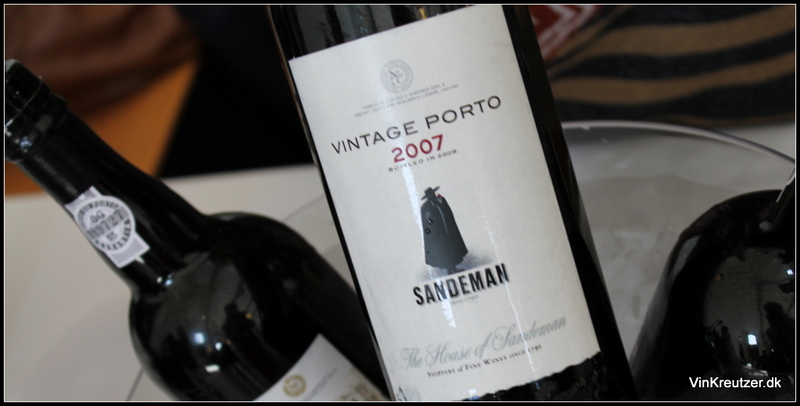 2003 Sandeman, VT – very tight made with good tannins and not to overly sweet or hot. Nice ’03. Made from grapes grown in the hotter Upper Corgo region, but still without getting to hot in the taste. Should have talked more with them about how that was possible. 2007 Sandeman, VT – intens fruit and very complex with high tannin. Seems very hot fot this normally more balanced vintage. 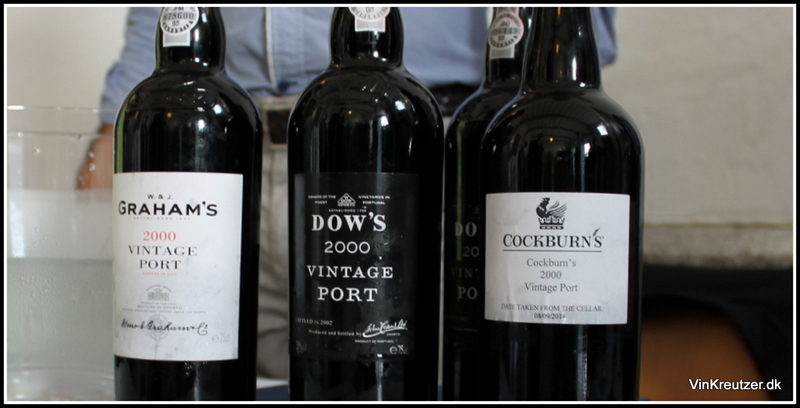 2003 Cockburn’s, Dow’s, Graham’s, VT – a taste of the ’03 hot vintage from 3 good producers. All showing terrible hot fruit, cooked notes and herbal aromas. The best was the Cockburn’s that showed a little balance. Dow’s was high on tannin and acidity and drying in the finish. Symington Family presented these 3 producers in both 2003 and 2000, which was very interesting. Must say that the 3 VT ’03 showed why this vintage is not my style. 2000 Cockburn’s, VT – very soft and mature, eay to drink and the first showing secunday aromas of leather, chocolate and coffee. This has opened up a bit, but it’s still a baby. Has the potential to develop into a very harmonious wine. 2000 Dow’s, VT – a huge wine with complexity going from red to black fruit. Seems very fresh and young with nice fruit acidity. On the palate this wine is alive, going all over. Balanced and showing an open mind, but still way too young to be drunk. 2000 Graham’s, VT – the most structured one of these 3 Ports. Very much like a gentleman with a good structure. The tannins ares still young, but giving room for a soft and open fruit complexity. More body and structure than Dow’s, but without the charm that you find in Dow’s. Fantastic showing from the Symington Family. Interesting to see also how they can have 3 producers where they keep the style of the house separate. Thank you for this. 2007 Quevedo, VT – dark fruit, floral aromas, schist giving a fresh edge to this. Very open and easy to drink now. 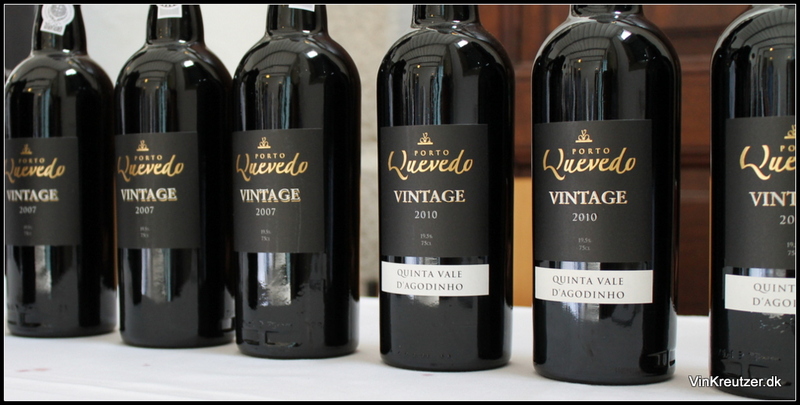 2010 Quevedo, Quinta Vale d’Agodinho, VT – very good and in so nice balance even though it’s so young. Nice intensity and the tannins standing strong without ripping you gums apart. Deep mature fruit balanced by fesh acidity and good sweetness. I was recommended to taste thesebefore leaving and they were the last I tasted. I good recommendation, nice people and very balanced wines. Thank you again to IVDP for inviting me to this magnificent event on the borders of the Douro river. 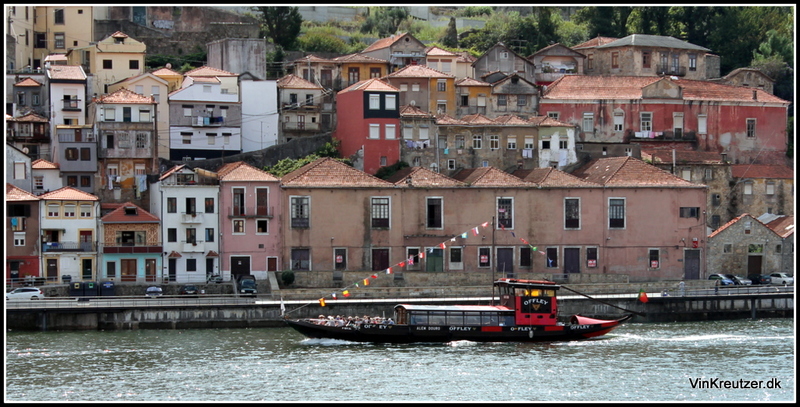 I will celebrate Port Wine Day for the coming years as well, if not in Porto then where I am.